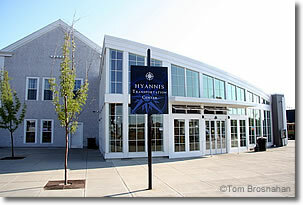 Hyannis is the transportation hub of Cape Cod, with its major bus terminal, ferry docks and airport. Here's a map of Hyannis landmarks and transportation airports, stations and docks. Follow US 6, the Mid-Cape Highway, to Exit 7 (Willow Street). At the end of the ramp, go south on Willow Street toward the airport and Hyannis. The Hyannis Transportation Center (215 Iyannough Road, corner of Main and Center Streets, Hyannis MA 02601, tel 508-775-8504, info@capecodtransit.org) is Hyannis's main bus and train station. The Transportation Center, right next to the station for the Cape Cod Central Railroad, is also the station for the weekend CapeFLYER trains between Hyannis and Boston (see below). It offers free Wifi, taxis, rental car companies, and shuttle buses to Barnstable County Airport (HYA; see below) and the Nantucket ferry docks (see below). Follow signs to the bus station. It's only a block (200 yards/meters) from Hyannis's Main Street, and a half mile (800 meters, a 15-minute walk with light luggage) from Hy-Line Cruises' Ocean Street ferry docks. Here's information on how to travel between Hyannis and New York City by bus, and by train and bus (faster). Cape Cod Regional Transit Authority (RTA) buses connect the towns and villages of Cape Cod with one another and with the mainland. Plymouth & Brockton buses connect Hyannis with Plymouth MA and Boston. Hyannis's Barnstable Municipal Airport (HYA) is the busiest airport on Cape Cod, with regular flights to Boston, Nantucket, and Martha's Vineyard, and connecting flights via Boston. The airport is on the northern outskirts of Hyannis at the traffic-circle ("rotary") intersection of MA 28 & 132, 6/10 mile (1 km) NW of the Hyannis Transportation Center, which is only 200 yards/meters from the town center (map). Several companies based here offer small planes for charter. Hyannis has two main ferry docks (map), at the foot of Ocean Street for Hy-Line Cruises passenger ferries to Nantucket, and Martha's Vineyard islands, and at the foot of Pleasant Street for the passenger and car ferries operated by the Steamship Authority (tel 508-477-8600). Shuttle buses connect the Hyannis Transportation Center to the ferry docks, but you can walk there in about 15 minutes if your luggage is not heavy. Above, the modern Hyannis Transportation Center. Free Wifi! 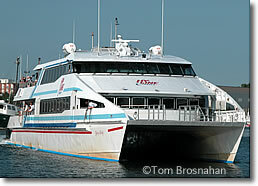 Fast Hy-Line catamaran ferry to Nantucket.